Recently it has come to our country’s attention that Veterans’ Affairs (VA) officials have falsified data to hide how long veterans were waiting to see physicians at VA hospitals. President Obama has called the situation “intolerable” and “disgraceful.” Former Republican Presidential nominee Mitt Romney has called the situation “inexcusable.” This situation has led both Democrats and Republicans to call for the resignation of VA Secretary Eric Shinseki. Dozens of patients at the VA Hospital in Phoenix have died while awaiting medical care. Rep. Jeff Miller (R-FL), Chairman of the House Committee on Veterans’ Affairs, stated that investigators have evidence that the Phoenix VA Health Care System keeps two sets of records to conceal prolonged waiting times for appointments. The damning VA Inspector General report showed widespread misconduct and ridiculously long wait times at hospitals for veterans. Senator Bernie Sanders (I-VT), Chairman of the Senate Committee on Veterans’ Affairs, told Rachel Maddow on MSNBC that the VA provides excellent care and that there are long wait times for patients to see their physicians across the United States, not just at the VA.
What do you think should be done about this reprehensible treatment of our veterans? 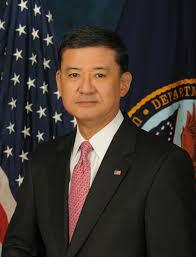 Should Secretary Shinseki be fired? Do you think this administration will hold anyone accountable for this activity? Do you think Democrats are concerned about our veterans, or do you think that they are jumping on the “Fire Shinseki” bandwagon because they face difficult elections in November? Why do you think this has happened? My objection to the VA is broader than just the current crisis. I believe matters such as healthcare should not be under the control of the government. My perspective is called ‘back to the body,” which takes the body as a prototype and exemplar for building and maintaining a society, including a nation. In the body, healing is not under the control of the brain–though the brain plays, of course, a role in healing. The brain (which corresponds to the government at the level of nation) supports and sets the conditions for healing, but healing is done by the body itself, especially the heart and the vascular system. I have a theory that people on both sides of the aisle are throwing Shinseki under the proverbial bus because it is an easy way to say, “Look here. We fired the person responsible and now we are bringing in new leadership to fix the problem!” The problem with that, of course, is that by firing Shinseki and hiring a new person to head the VA, the clock gets reset and the topic goes on hiatus. The new guy will get introduced, do an extensive 2 year study, and so on. By keeping Shinseki, the pressure remains on to improve care immediately because there is no scapegoating. Honestly, if some people are fudging logbooks to make care look better than it actually is, Shinseki is not at fault – he can’t be everywhere in the country double and triple checking accuracy of mundane logs. That is the job of a Quality Assurance/Quality Control officer in a lab setting. In a system that big, tasks MUST be delegated. The problem arises when the government is either reluctant to or unable to fire poor workers because of contracts or lack of direct oversight. So, I don’t think firing Shinseki is the answer. Obama should be impeached for violating his oath of office. He murdered vets with VA death panels. To start off, Obama campaigned in 2007 about the VA problems, said it was a top priority to correct the problems but like everything with Obama it was just words. Democrats and Republicans both are guilty of the VA problems. The VA has had problems for years and no one has stepped forward to make notable improvements, had an effort been made, who knows, perhaps the double list scam may not have occurred. This VA double list puts things over the top now because people mat have needlessly died due to lack of timely treatment. Back to my initial point, Obama rightfully brought attention to the VA and it’s problems, Shinseki should have been aware and initiated changes to make improvements, but that never happened so yes he should be fired. One other thing, watch out America, the Obama and the Dems touted the VA as a good example of what Obamacare could be. his successor will run into the same stonewall of an entrenched bureaucracy. thats where the power is. Every single administrators who falsified wait lists to protect their bonus’ should be fired & prosecuted for fraud. Clerks unable to keep up w/ application data imput should be fired. vets should be given no out of pocket costs vouchers to civilian hospitals.